Like a lot of expats here, I love it when my mum sends me little parcels full of little goodies we can’t find here, mainly books and of course food! There is always a sense of excitement when expecting a parcel, as well as fear… fear that Quarantine decides the parcel contents are too dangerous for Australia and destroys them! However, even though all the parcels sent to me have been opened and inspected, nothing has been confiscated yet (cross fingers touch wood). This time, my Mum sent me some Bergamotes de Nancy, as I have been bizarrely obsessed with them since my last trip to France a year ago. We were wandering in Paris along the trendy rue Montorgueil with my bestie Céline who was on a mission to find pressies for her family holiday. She set her choice upon a Confiserie and as she was completing her shopping, my eyes fell on those beautiful golden lollies: I immediately knew that I have had these as a young tacker and used to love them, even though I would have been hard-pressed to name the lollie or what it was flavoured with. I bought a couple and kept them for later… a few minutes after, really. As I ate the bonbon and it started melting in my mouth, I was transported years and years backwards, and vague childhood memories started to emerge. It’s magical how tastes and smells can really take you back in time! However it was too late, our stay was drawing to a close and I didn’t have the opportunity to buy a whole pack. Well after my return to Sydney, the holiday being just a distant memory, I still couldn’t, nor didn’t want to chase away the taste of that Bergamote… I decided to track some online and get them shipped from the motherland! 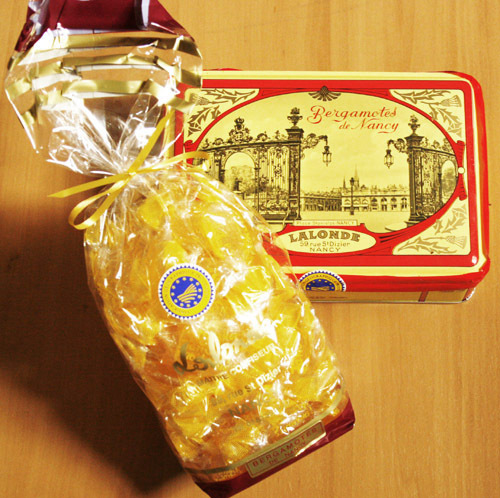 These bonbons are a specialty of Nancy in the Lorraine region, North-East of France, home of my mother’s family (hence the childhood memories I suppose). The following Duke’s (Stanislas) pastry chef had the idea to make a candy out of it and it quickly became the king’s favorite treat. 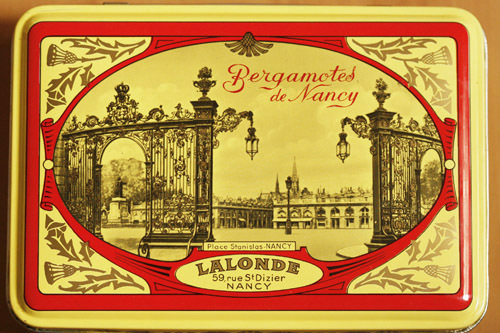 The use of Bergamote was however very confidential until 1857, when Godefroy Lillig, a confiseur from Nancy, created the square and translucent candy we know nowadays. To make Bergamote candies, some Bergamote essential oil is poured into boiling sugar syrup, provoking a big cloud of smoke. The cooking temperature goes up to 150 degrees to make the sugar very hard. 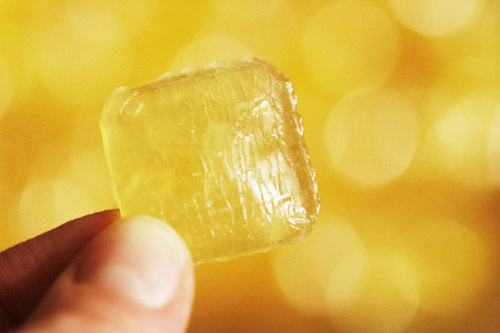 The resulting paste, similar to molten glass, is then shaped into bars, then broken into squares. So my parcel has arrived, and I have now plenty of Bergamotes to see me through at least a year! I recently came across another food blogger who had his mother send him a certain type of Barilla pasta from Germany as he was devastated not to find them here. In the end, Barilla Australia had his favourite Barilla imported just for him! What about you: are there goodies that you miss so much from home that you have a relative send them to you by post? Share your stories! This entry was posted in French Specialties and tagged Bergamote, Candy, Nancy. Bookmark the permalink. Not me, but my brother who lives in Thailand gets my mum and sometimes me to send him things. This got a bit much, so we started sending recipes. He now owns and runs a business that caters for the homesick expats who live in his area. Amidst the steaming hot streets of southern Thailand, you can now buy and eat anything from freshly made Apple Crumble to chocolate mousse, Lasagne, Lobster Bisque salads and all sorts of stuff that he misses about home. It seems that lots of people miss the various tid bits from home. Most of the reeipes come from our Mother Pat (now 84) who has been a foodie ever since she was a tacker, cooking cakes and soups and casseroles for her father’s pub from the age of about 10. She has lived in many places in the world and infected all of us kids with a passion for a wide variety of food, cooking and naturally eating. After life, this is the greatest gift she gave me that’s for sure. I have no stories to share and I haven’t lived overseas (yet!) but there are always things that I stock up on when im overseas to bring home because I can’t source them (or they’re too expensive) here. From Scotland i’ve brought back a few bottles of a whisky blended with honey and sloeberries and from England I seem to always find my suitcase packed to the brim with different kinds of tea! I find that when I finish consuming something I have the perfect excuse to go overseas again! p.s. I need to try those beautiful sweets! They look adorable! Hi Katie, thanks for your comment! Usually those that I am cravings for and won’t able to find here possible not allowed to be imported. HAHAHA! I know!! The box was an even better excuse to buy them! the lollies look good, but i love the wonderful packaging, Sandra! 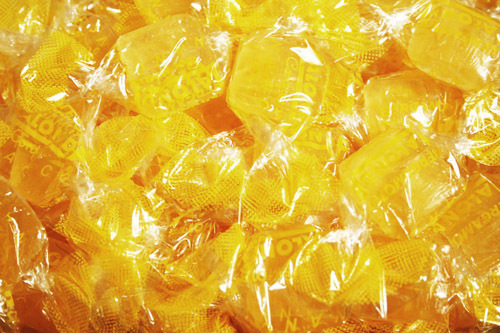 I love hearing about new stuff and as I adore bergamot I’m really interested in this ‘lollies’… (oops! candies 🙂 Love the box too.